The woman tells Miller she was paid $12.50 an hour to sign affidavits for those lawsuits. Those documents testify to the veracity of the debts owed and are used to garnish wages, empty bank accounts and repossess property — so their accuracy is essential. But on busy days, the woman says, she would sign 300 such affidavits in an assembly-line-like process. In batches, she’d sign the documents, the person next to her would notarize them, and another would stuff them in envelopes to be mailed to out-of-state law firms. There, someone would print out a legal package, attach documentation, have a lawyer sign it and finally mail it to local courts like Spokane County Superior Court. “Did you ever read completely through any of the affidavits you signed?” Miller asks the robo-signer. Welcome to the new era of debt collection. Forget about bat-wielding thugs or polite, local collection agents who were always willing to work with you. This is big business, with automation, rapid production lines and little oversight. Debts are bundled and sold, again and again, between huge companies, while vital information is lost, records are destroyed or manufactured, and legal documents are blindly signed. At every level — from the banks to the debt buyers to the law firms and the courts — the system is rife with errors that often go unnoticed, even as they upturn the lives of thousands of Americans. Complaints about debt collectors to the Federal Trade Commission have more than doubled since 2006, and cautionary tales aren’t hard to come by. Like the Newport, Wash., woman tossed in jail for failing to respond to a court case she was never told about. Or the Spokane man who paid his debt, but couldn’t convince the collection agents who continued to chase him. Or the bank exec fired after protesting that resolved debts were being resold for collection a second time. These incidents, Miller says, are just a drop in the bucket. Hundreds of other cases with similar problems pass through the court system unchallenged, he says. Nanette Paxton parks her 2002 Suburban outside the Spokane County Courthouse, and then, still gripping the steering wheel, cries. And for the first time in years, she prays. Not a prayer of faith — she’d already lost her faith in God and justice and everything else — but a prayer of utter desperation: If there’s even a chance you really exist, please help me now. She wipes the running mascara off her face with some toilet paper and walks toward Judge Ellen Clark’s courtroom. She doesn’t have any legal experience. She hopes her personal story will be enough. She could tell the judge about the divorce, how she was left caring for five children, surviving on food stamps and inconsistent child support, watching her debts pile up. She couldn’t return to work, she could say, not with a 16-year-old with autism and a 7-year-old with separation anxiety, and a back still hurting from a car accident. She had turned to her Discover Card from time to time to buy school clothes and Christmas gifts. But then she got behind on her payments, and a Seattle law firm, using the courts, took the last $231 from her bank account. And now, she doesn’t even know if she’s in the right courtroom. She asks an older man in a suit. On the spot, he offers Paxton legal representation. The man is Mike Kinkley, a nationally known consumer protection attorney based in Spokane. After a few minutes scrolling through Paxton’s case on an iPad, Kinkley and his son Scott find an error. Paxton is eligible to have $500 in her bank account exempt from garnishment, as long as she claimed it. But she never knew about it — the firm suing her never sent her the required information. For Paxton, the mistake had already been devastating. She had inadvertently bounced checks against her emptied account, racking up fees that put her deeper in debt and leaving on her last quarter tank of gas. But Kinkley’s seen far worse. On the board of the National Association of Consumer Advocates, he’s twice been a panelist on FTC debt-collection roundtables. information that is left blank, flawed affidavits, missing pages and improper interest rates. In the 1980s, financial minds in the private sector dreamed up a new business model: Buy huge bundles of debt from banks at vastly discounted rates — often as cheap as two or three cents on the dollar — rake in the easy-to-collect debts and then sell the rest. At the Federal Trade Commission, Tom Pahl, the assistant director of the Division of Financial Practices, says debt selling has become a “habit” for large banks. Debt that consumers aren’t paying looks bad to both stockholders and regulators. It’s easier to sell it. Federal rules actually encourage it. “It’s really picked up in the last decade or so,” Pahl says. Computer systems assess bundles of debt through complicated algorithms, telling companies which debt to buy, which to try to collect, and which to just sell to the next debt buyer. “It’s not uncommon for debt to be sold two or three times before it’s collected,” Pahl says. He remembers one debt, 12 to 15 years old, was traded between about five different buyers. For consumers, there’s a consequence: information loss. The identities of debtors, their addresses, phone numbers, amounts owed and interest rates can all become lost, obscured or changed during the transfer. Mark Schiffman, spokesman for ACA International, a debt collector industry trade group, says debt buyers are not “horrible monsters.” Third-party debt collectors, the group argues, benefit the economy by ensuring those who loan money get paid. The majority work hard to follow the law, Schiffman says. But that can be complicated. The debt being sold can be old, and the associated documentation can be missing, of low quality or may have never existed in the first place, he says. Buying more documentation can cost extra. “The lack of documentation doesn’t necessarily mean these debts are not owed,” Schiffman says. He adds that he’s against robo-signing and anyone still using the practice should pay attention to how the FTC and other groups have been cracking down. Still, not all problems are inadvertent. Linda Almonte, one of the banking sector’s few whistleblowers, intentionally broke a non-disclosure agreement to speak out on the issue with various news outlets. As a 39-year-old executive for J.P. Morgan Chase, she says she oversaw 74 different litigation and collection departments. She knew the bank’s out-of-date computer systems could cause all sorts of errors, and that attorneys sometimes entered incorrect codes. She alleges she personally witnessed a bank executive shred important consumer information, instead of adding it to their file. But she didn’t know the depth of problems until she and her staff began combing through 23,000 consumer accounts that Chase was planning to bundle and sell to a debt buyer. Supposedly, each one had received “judgments,” court confirmations that the debt was owed. Page by page, her team discovered a far different story: More than 50 percent of the accounts didn’t have valid judgments, and at least a quarter overstated the amount the consumer owed. She repeatedly raised those concerns with her superiors. In less than a week, she was fired. The deal went through anyway, and the bundle was sold to a new debt buyer. Last year, Minnesota Attorney General Lori Swanson filed a lawsuit accusing Midland (and Encore) of defrauding Minnesota courts and its citizens, and she took specific aim at robo-signing. “The company put its thumb on the scale of justice to unfairly tilt the collection process in its favor,” she said. In a statement emailed to The Inlander, an Encore spokesman says, “Midland has significantly restructured its affidavit process since the court’s initial ruling in 2008, and we continue to work to ensure best practices.” A recent ruling found their new affidavit process insufficient, but Encore says they’ll continue to work to improve it. Miller, the Spokane attorney, doesn’t buy it. He believes their changes are small evolutions, mainly meant to protect the company from more lawsuits. “I’d be hard-pressed to believe that Encore has now invested the money and training and infrastructure for employees to actually investigate each file,” he says. But Midland and Encore aren’t the only ones in on the action. Suttell & Hammer, a law firm in Bellevue, Wash., received more than 8,000 cases from Midland in four years, and has been accused of using similar tactics. 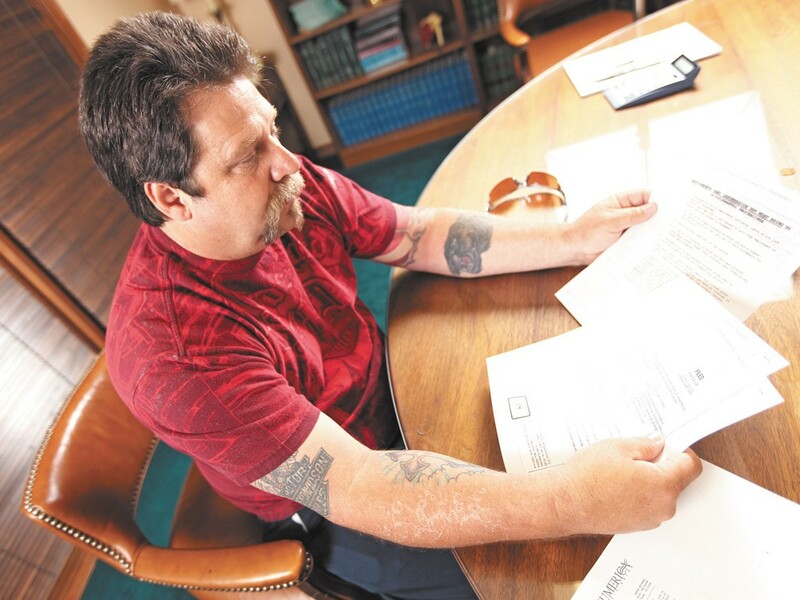 Michael Vance, a Spokane man who works at Fairchild Air Force Base, first learned of Suttell & Hammer when he read a letter informing him that his wife’s wages would be garnished. The letter had Vance scared. “We didn’t want to lose our house, our cars,” Vance says. “I didn’t want them to seize my accounts.” So he did something drastic, but immediate: He withdrew $10,000 from a 401k retirement account early — massive penalties cut it to less than $4,000 — called Suttell & Hammer, let them know he was sending a cashier’s check and mailed it off. “I figured it was done. It was over,” Vance says. But the firm didn’t stop the garnishment. He called multiple times, faxed them a copy of the check he’d already sent. He received an order demanding his wife appear in court — threatening her with arrest if she didn’t show — for a debt he’d paid eight months earlier. “I was furious,” Vance says. “I couldn’t believe that was happening to me.” And, then, in November, she was ordered back to court yet again. Caitlin Finley, a Suttell & Hammer attorney just out of law school, had given sworn testimony in writing that Vance still owed the debt. Her replacement did the same several months later. (In Washington state, it’s considered perjury to give a statement “one does not know to be true.”) If they had read the notes attached to the file, they would have seen that the Vance had claimed repeatedly that he’d already paid. But Suttell & Hammer never trained her to read them, Finley says in a deposition. They taught her to simply look at a single financial screen on the computer, and sign based on that. Her workload, she says, was too high to do anything else. But it wasn’t an isolated case, says Kinkley, the Spokane attorney. He’s sued Suttell & Hammer several times. On one occasion, the firm garnished exempt Social Security money from an elderly couple. In another case, the firm managed to get a garnishment on a case that didn’t actually exist. The right debt attorney can spot the mistakes introduced through automation, but the vast majority of debtors never see an attorney, or even show up to court. In the hallway of Spokane Superior Court, Nanette Paxton clutches rolled-up court documents. Her eyes are still red from crying, but this time, she’s smiling. The judge granted the exemption. The money was restored to her bank account, the fees were reversed. She had someone at her side in Kinkley, the attorney she happened into inside the courtroom. Local lawyers like Kinkley and Miller show up to the courthouse when debt-collection cases are scheduled, as part of the Volunteer Lawyers Program, started by Miller in May 2011. When they arrive, a judge asks if anyone needs a lawyer. Usually they do. The group has trained dozens of other local lawyers, who traded volunteer time in exchange for legal education credits. “We showed them how to tear apart a file in a matter of minutes,” Miller says. Against debt buyers, these volunteer lawyers have a 100-percent win record. Against original creditors, they’ve only lost once. Yet, of the five debt-collection cases on the schedule the day Paxton appears, she was the only one to show up. Most debtors never respond to notices of lawsuits — which can mean the debt collectors often win with “default judgments” no matter how weak their case is. Last year, Spokane County District Court alone ground through 7,000 debt-collection cases — about 27 for every working day. Nearly twothirds of those debt cases were default judgments. In some communities, the rate is over 95 percent. The Federal Trade Commission has tried to figure out why the default rate is so high. The simple answer, the one favored by debt collectors, is that debtors don’t show up because they know they owe the debt. Even with the Volunteer Lawyers Program, debtors struggle to find professional representation. Kinkley’s office gets about 15 calls a week, and he has to turn away most of them. After all, representing penniless clients isn’t the most lucrative area of the law. Miller and Kinkley spend a lot of time arguing with courts over attorney fees. It’s not just a Washington problem. Henry Madsen, an attorney in Coeur d’Alene, tells the same stories. And unlike in Washington, Idaho is an “open border” state. Any licensed debt collector —whether in New York, Minnesota or Kentucky — can collect in Idaho. Sometimes, the debtor never hears about the lawsuit at all. There’s an expression for it: “sewer service,” the notion being that low-paid process servers sometimes simply throw away the suit in the sewer and say they served it. Gerry Russell, a truck driver for Franz Bakery in Spokane, remembers discovering, right before a trip to Montana, that his bank account had been garnished without warning. The servers went to Russell’s old address, where he hadn’t lived in for over two years, and delivered court documents to a 50-year-old man with gray hair. Russell was 37 at the time, and bald. “They filed a judgment, did a garnishment, served someone else papers, and never contacted me once,” Russell says. ABC Legal Services, based in Seattle, is one of the largest process server companies in the nation. CEO Stephen Carrigan says his company uses mobile GPS apps as well as route-and-travel time analysis to thwart unethical servers. Yet, ABC currently faces 14 different lawsuits in California, filed by a single attorney, Fred Schwinn. Schwinn says records show some ABC process servers claiming to be at two places at once. Another claimed to have served a woman who had actually been dead for months. “If you’re [serving] 60,000 lawsuits, yeah, you’re going to have a few outliers,” Carrigan says. For some debtors, those outliers can mean unnecessary jail time. Janelle Leslie, a 39-yearold from Newport, Wash., remembers the jail cell she slept in overnight. “It was dirty. It was ugly, it was concrete,” she says. The food — tapioca pudding and bread — was horrible. She had called the Pend Oreille County Sheriff’s Office on her estranged husband. But when the deputy arrived, he led her away in handcuffs for failing to appear in court. “My husband was laughing,” Leslie says. She was being punished for a medical debt she didn’t even know she had. In the Red Lion Barbecue & Pub in Spokane, Kinkley, with sleeves rolled up and his tie loosened, orders an iced tea. He and Miller, sitting across the table, have decided to finally send a letter to the Washington State Bar Association’s Rules Committee about suggestions for reform. Most of their suggestions are aimed at making it simpler for debtors to respond to lawsuits (by providing a fill-in-the-blank form, for instance, or giving consumers more time before filing a default) and requiring that firms have more solid proof before filing them in court. Both are very careful to not be seen as criticizing local judges. “They’re so overwhelmed with work,” Kinkley says. “I believe they have an impossible task under the system.” But they see reason to hope as well. One judge in Seattle, Kinkley says, examines the first few documents from a firm, and if the documents have flaws, he sends the entire stack back. Lawmakers are beginning to pay attention in Olympia. Rep. Derek Stanford, D-Bothell, ran across Leslie’s jailhouse story on Cross- Cut, a website dedicated to Washington state politics. He decided to write a bill, signed into law in March 2011, that requires collectors to inform the debtor of either the name of the original creditor or the last time a payment was made on the debt. On the national level, the Federal Trade Commission and the Securities and Exchange Commission have both moved to punish abuses from the larger firms. The FTC is examining the industry again this year and plans to issue a follow-up report this year. The blows from a major class-action lawsuit could also catalyze reform, say Kinkley and Miller. They’re still pursuing their lawsuit against Encore — aiming for a verdict as high as $50 million — and believe it could scare other debt buyers into compliance. “When the investors see Encore is not able to make the billions of dollars, I think it will get their attention,” Kinkley says. Mostly, though, they’re fighting the debt machine one case at a time. In the Vance case, Kinkley successfully sued Suttell & Hammer for $45,000. “It’s just a cost of doing business for them,” Kinkley says. Yet, it helped Michael and Laura Vance. Paxton’s spent years trying to avoid bankruptcy, borrowing from friends, moving back in with her parents, but this has given her a small reprieve.